Barcelona moved four points clear at the top of La Liga thanks to Luis Suarez’s winner. Sergio Busquets was only fit enough for the bench, so Javier Mascherano played in the holding role, with Jeremy Mathieu the left-sided centre-back. Otherwise, the team was as expected. Xavi Hernandez had surprisingly started over Ivan Rakitic in the reverse fixture, but Luis Enrique didn’t replicate that error, so we had the unusual sight of Barcelona without either Busquets or Xavi, the two players who usually control this game. Real were also as expected. James Rodriguez is still out, although Luka Modric has regained full fitness and continued in midfield alongside Isco. Toni Kroos was recalled by Carlo Ancelotti, having been rested for the first time this season the previous weekend. The sides were evenly matched here. Both teams had good spells but this game wasn’t decided one particular zone, or because either side did much better than their opponents – aside from finishing. This felt like a different type of Clasico to usual. For a start, the pace was much slower, primarily because whereas Barcelona used to press energetically high up the pitch in the opening stages of matches, here they retained a much deeper defensive block, often retreating into their own half, and attempting to remain compact from back to front. Therefore, whereas often Real are trying to play quick passing combinations around the press, here they were allowed time to build up play steadily. 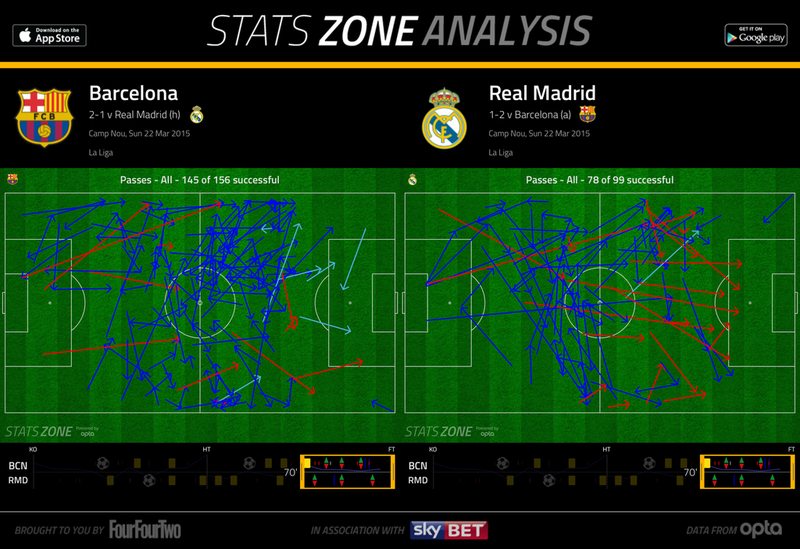 The reverse was also true – Real’s forwards contributed little when Barca had the ball. The formations also contributed. With both (more or less) in a 4-3-3 system – although Real’s was partly a 4-4-2 too – both teams were able to find their holding midfielder reasonably easily. Toni Kroos moved up to half-heartedly pressure Mascherano in the opening stages, but generally the Argentine could receive possession in space. Real found it more difficult to locate Kroos when Luis Suarez positioned himself to deny balls into his feet, although Kroos was better at starting quick passing combinations than Mascherano. Barcelona’s wide midfielders tended to take up wide positions, but aside from a couple of Andres Iniesta one-twos in the opening stages, they rarely looked to advance beyond the three-man forward line. Rakitic found space because Isco and Marcelo were highly concerned with Messi, while Suarez was pushing back the two Real centre-backs, but Barcelona rarely played good penetrative balls into Rakitic. Without either Busquets or Xavi Hernandez, these short, simple but crucial passes into the final third are lacking, and often Rakitic wandered around, free, but uninvolved. Isco worked hard defensively, particularly to cover for Ronaldo, but contributed relatively little on the ball. The midfield conductor was Luka Modric, who combined nicely with Kroos in deep positions, and did more than Real’s other two midfielders to connect midfield and attack through his positioning and passing. This became more difficult for him as the match continued, however, and he probably tired. After that point Real became more of a broken team. This was where the real juicy action was set to happen – Real boasted the world’s two most expensive players out wide, Barcelona had two superstars of their own. Surprisingly, however, the full-backs all coped well. Dani Carvajal stuck very tight to Neymar, an approach replicated by Jordi Alba against Gareth Bale. Here, both full-backs deserve tremendous praise for nullifying their direct opponent, and it’s also worth considering that they probably knew they could stick tight because the opposite full-back was rarely in a position to overlap, because of the threat of their opponent. For example, when Bale drifted inside, Alba could continue to mark him in the knowledge that Carvajal wouldn’t usually be storming past Neymar into his zone. Alba became more of an attacking threat late on and pushed Bale back. Down the opposite flank was more interesting. 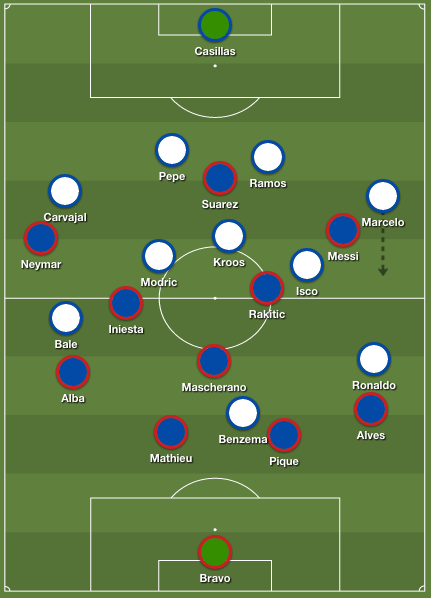 For a start, this is probably the first Clasico where Leo Messi and Cristiano Ronaldo have played down the same side – Messi has usually been a false nine, and Ronaldo was often shifted elsewhere during the Jose Mourinho era. Here, neither performed particularly well, although their roles impacted upon the performances of other players. Ronaldo stayed high up the pitch and showed little interest in defending, although Alves remained in a cautious position anyway. Rakitic tried to shut down Ronaldo’s space to prevent him coming inside during the first half, although sometimes he was slow to do this, and Ronaldo had one good shot tipped over by Claudio Bravo from his favoured inside-left position. Ronaldo wandered across the pitch throughout the first half, sometimes playing on Bale’s side (without Bale switching) and sometimes moving upfront, although he rarely enjoyed good moments in these zones. Isco was attempting to do something similar against Messi, and while he showed some typically magical touches on the ball, Messi’s overall influence on this game was minimal by his standards (although his free-kick allowed Mathieu to head the opener). He influenced things much more in the second half, when he took up a narrower position, but overall this felt like a game where the false nine role would have benefited him – especially considering Barca were weaker than usual in midfield. What was most intriguing, however, was that Messi didn’t help Barcelona defensively. Usually Barca press and Messi is a crucial part of that, but in this more reserved defensive shape he rarely tracked Marcelo into his own half, and therefore the Brazilian left-back was arguably the game’s key player. He repeatedly dribbled forward, sometimes on the overlap but also into more central positions. He prompted the attack which led to Ronaldo hitting the bar from Benzema’s cross, then had a good right-footed effort blocked by Jeremy Mathieu. He also stormed forward to contribute to a second half attack which saw Benzema firing at Bravo. Barca weren’t finding Messi quickly enough on the break for this aggression to cost Marcelo and Real, although there was one moment when he was dispossessed on the left touchline, and a mini-counter from Barca saw Neymar crossing for Messi, who probably should have left the ball for Alves rather than heading towards goal. 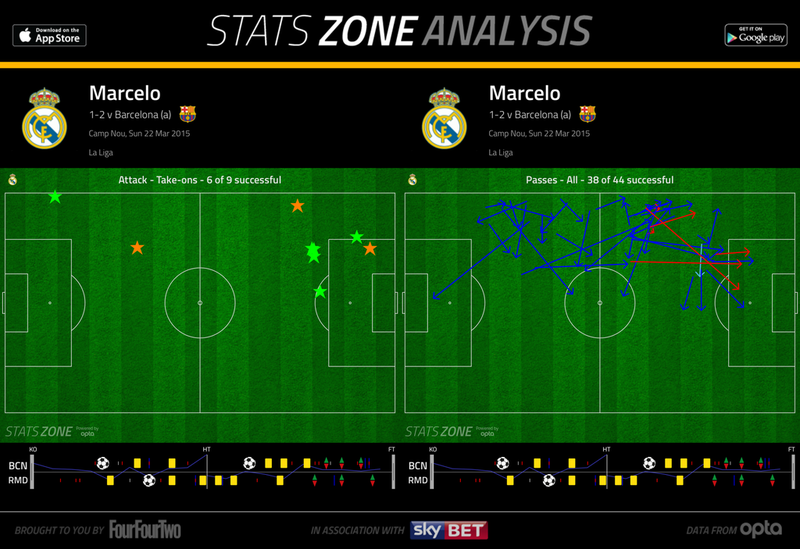 Overall, however, Real were actually getting the better of the Marcelo v Messi duel, which is highly surprising. Then, there were the performances of the strikers. It’s unusual to say this about a non-scoring striker on the losing side, but Benzema was the game’s best player (with one of his direct opponents, Gerard Pique, a close second). Benzema was magnificent here – the timing of his runs was superb, his link play was vital in simply connecting the whole side (particularly the midfield and the wingers), and he created two golden chances for Ronaldo. The first saw Ronaldo volley against the bar, the second was Real’s equaliser, where Benzema’s backheel was truly wonderful. For that goal, it was notable that Real broke in the aftermath of a Barca set-piece, before their defence had time to become organised – that was very notable because of the way Barcelona were opened up so easily. At the other end, Suarez didn’t perform as well. Whereas Benzema was trying to find space, Suarez often seemed too concerned with physical confrontations with Sergio Ramos and Pepe, which inevitably descended into a petty running battle. Full of energy, Suarez’s movement was good but his combination play with others less impressive than Benzema. However, he decided the game with a truly exceptional finish, following a long ball from Alves. On that note, it was significant that Barcelona’s two goals came from a set-piece and a long ball, whereas Real’s came through combination play. Clearly, Barca weren’t actually playing long ball football, and yet the goals illustrated how the approach of the two sides have become less distinguishable. For example, it was peculiar to see Real with a better deep-lying distributor, and a forward more capable of contributing to link play. This wasn’t possession versus counter-attack – if anything, it was two sides who were both comfortable in possession, but more dangerous through counter-attacks. The root of this identity shift involves the nature of the clubs (and managers ) at present. Whereas Pep Guardiola and Jose Mourinho were two tacticians with a specific vision for their club, Luis Enrique and Carlo Ancelotti are in difficult situations at present, and forced to play to the strengths of superstar individuals rather than introducing a system-first approach. Therefore, these two teams tactics’ are, by and large, simply the natural consequence of their first-choice players, whereas in previous years there would be specific tactical decisions in this fixture: Mourinho would block up the midfield with a destroyer, Guardiola would play Iniesta in the front three and therefore use an extra midfielder himself. Barca and Real are now two relatively similar teams – any of Real’s midfielders could play in the Barca side, any of the Barca forwards could play at Real. The match was reasonably even until Suarez’s goal, but Barca were very impressive at shutting down the game. Neither side made any changes until after the 73rd minute (again highlighting the emphasis upon individuals – it’s difficult for either coach to sacrifice key attackers) but Barcelona’s changes were more effective. Busquets and Xavi replaced Rakitic and Iniesta and played in those roles, rather than their natural positions. The midfield trio of Mascherano, Busquets and Xavi now commanded the centre of the pitch, with Xavi cooling the tempo of the game and retaining the ball expertly in the final 20 minutes. Ancelotti’s only major change was Jese on for Isco, and a move to a 4-2-4ish system, but realistically this opened out the game and allowed Barca’s midfielders to control it. As Real tired, the gap between midfield and attack was more obvious, and this was costing them both offensively and defensively – they couldn’t play good combinations, and they couldn’t press as a unit. Ancelotti summarised the game well. “I think we did very well for an hour until the second goal. The game then became very difficult for us,” he said. “We were very solid at the back but we lacked substance. We did well for an hour, the remaining 30 minute not so much. For an hour we played better [than them], and in the last half an hour, Barca’s counterattacks were terrible [for us]. “We’re two great teams and they won. I think both teams deserved to achieve something important, but I’m happy for them. We played like we usually do. We don’t always do it, but we tried to play with two banks of four. Bale played deeper because Alba pushed up a lot. Enrique’s comments were also interesting. “In the first half we struggled to press and Madrid took control [of the game]. In the second half, we acknowledged [Madrid’s] struggles going forward and the goal gave us peace. Overall this wasn’t the most fascinating Clasico in terms of the tactical battle – in the long run, Marcelo’s battle against Messi might be the most significant feature of this game, as it suggests opponents can push their full-backs forward dangerously and exploit the lack of work rate from Barca’s forwards. Am afraid Michael, if you missed an important aspect about this game – Real had one full free week for the match, whereas Barca had a big mid week match against City. Barca were tired and in their own way kind of sat back in the first half, with no real pressing which they normally do. Messi stayed completely on the wing without influencing much except for a couple of runs, in one of which, he embarassed Kroos. Real was supposed to be the fitter team (always Barca is termed physically weaker)but by the 60 minutes, they were all tired and Barca players were giving them a good run. In the second half, Messi started playing more to the centre and that had a big influence on Barca. Every one says he was invisible, but had 4 key passes. If Alba, Suarez or Neymar(terrible finishing!) finishes, he would be having 3 or 4 assists in the game (so its interesting that you say Barca had better finishing). (If Neymar had finished that tap in early on in the first half, Real would not have equalised immediately on the return). Inspite of their rest and advantage on phyiscality, it was Real who looked really tired, is one very important aspect of this classico. If not for their tiredness, I wonder if Barca would have had it so easy in the last 20 – 30 minutes. Benzema was definitely Real’s best player, and Pique for Barca. Well, Luis Enrique did that around the 85th minute, subbing Neymar for Rafinha, and then Barca’s system was truly a 4-4-1-1 (Mascherano-Busquets-Xavi-Rafinha, Messi as a 10/false 9, and Suarez). Ancelotti then made the Modric/Jese change, and in the last minutes it looked like Barca had 5 v 2 in midfield. This came after they were up 2-1 with 5 minutes left. The context of the comment is “sacrifice key attackers” when the game is tied or you’re losing. yep, you’re right. I didn’t read well enough before commenting. Michael’s point was about coaches not making early changes. Thanks for correcting me. Excellent article and conclusion. I would agree with almost everything you have said. However I disagree with Benzema as MOTM, I would swap your two around. Some of Pique’s headers and blocks were crucial and he prevented a lot of the time real madrid getting into the barca box, but as you said Benzema was also excellent. I think the one thing you missed in your conclusion but sort of alluded to was the fact that Barcelona seem to really lack cohesion between midfield and attack, Suarez’s link up play is poor still and when Messi doesn’t get involved they struggle to resolve this. This game needed Messi at F9, at least in the 2nd half. Real Madrid played very well until Modric lungs starts to request for oxygen. Benzema is not a top class player, and his shoot to Bravo’s body close to 5 meters to the goal line make me wonder why he is the center forward of RM. He is a very good player but another one like Suarez, Ibra, Tevez, can do it better than the Frenchman. True is that he is playing for Ronaldo or Bale, but he forgot he is a forward, not a charity’s nun. He scored goals, true, his numbers are there but if you look deeper, his numbers are not against stronger teams so you can be confused easily if you do not do an extra effort for do a good analysis. Benzema might miss from 5 metres out, but is just as likely to score with a volley with his back to goal from outside the penalty area. OK, I’m exggerating, but you know what I mean. Capable of a stupid miss one second, and brilliance the next. I agree, he is not an orthodox centre forward and propbably shouild get more goals. But does Ronaldo really want to play with an orthodox centre forward? And wasn’t Benzema the best player on the pitch after Modric? For me, the real problem lies in midfield. Real Madrid is asking a group of attacking midfielders to play like central midfielders, and defensive midfielders. It worked for a few months, but time has shown that asking these guys to totally adapt their game is not working. You’re right about the midfield. Toni Kroos can play the deep playmaker (or regista) but that’s not his best position. He’s often better in a role that is named No. 8 or No. 10 in Germany (central midfielder/playmaker). Don’t get me wrong. Kroos has a great timing concerning pressing or positioning. But if Real faces a counter attacking team or a team that attacks the midfield with pace, Kroos might not be the best holding midfielder. Moreover his talents with the ball are not appreciated enough in this position. Kroos has to pay attention that he isn’t be reduced to a Xabi Alonso role (Who has his problems in Bayern’s midfield partnerships as well). Of course one player’s role can’t be evaluated without the players around him. With Modric and Co. in the right positions, Real’s midfield works for now (most of the time). And is there a better regista in this squad than Kroos? One thing I haven’t seen on here yet is the role of playing conditions on the match. Everyone’s talking about how cheaply Barcelona was conceding the ball (@Michael, do you have pass completion comparatives? ), but it was highly evident that many of the players struggled with dialing in their pace on the ball in the face of a wet pitch. This isn’t an excuse, but it’s something that Real clearly did better coping with, especially in the first half. I also feel that Bravo should be given more credit along with Pique for holding Real to a single goal. His performance was very good. I used to spend nearly an hour making presentable lineups in Powerpoint! Loving the new formation graphics too, very smart.